Location: On prominent site fronting Tabor Road with North Avenue to the rear. The Independents (who transferred from Groeswen) first held meetings in a cottage in Maesycwmmer c1827. 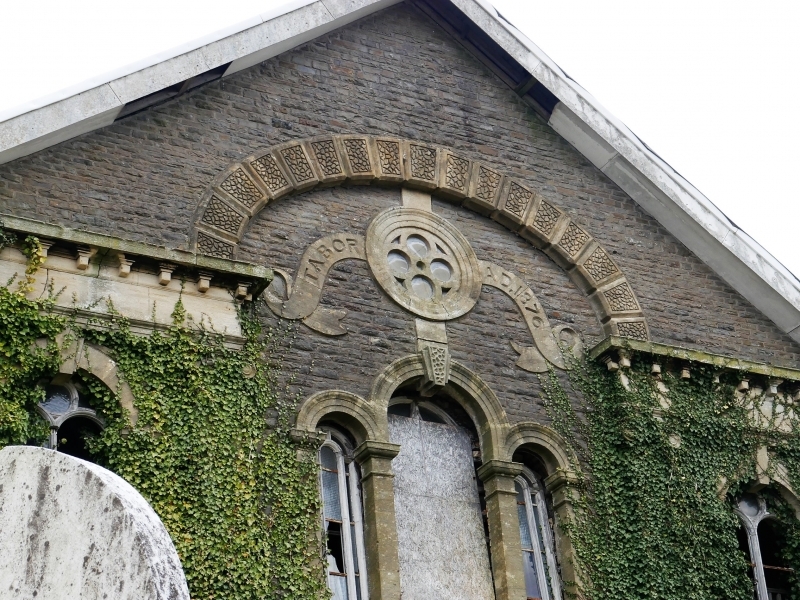 The first chapel was built in 1829 on land leased from the Gelli-deg estate. A plaque on the wall records this date. The chapel was rebuilt in 1855 at a cost of £512 and was opened in 1856. This building was retained when a new chapel was built in 1876 costing £2,000. The architect was the Rev. Thomas Thomas (Thomas Glandwr) who had developed the so-called "Landore Style" at Swansea, characterised by a central arch breaking up through the pediment, and often called a "Glorification Arch". The feature ultimately derives from Renaissance facades, perhaps borrowing the form and symbolism of Roman triumphal arches; earlier British examples by Wren at Greenwich Hospital, or transept elevations on Great Model of St Paul's Cathedral. The interior ironwork of the 1876 chapel, gilded and painted in imitation of oxidised bronze, appears never to have been repainted. Classical-style chapel at right angles to the earlier chapel. Ambitious 3-bay entrance front with "Glorification Arch". Constructed of coursed Pennant sandstone with extensive pale freestone dressings, slate roof, projecting verges and plinth. Four Ionic pilasters on plinths carry an entablature into which breaks a central elliptical arch, under which is an oculus with scrolls with inscriptions "Tabor" & "1876"; a Venetian window with Italianate tracery; and 2 round-arched doorways with keystones and camber-headed doors, under a heavy entablature. Tall arched windows in flanking bays, also with Italianate tracery. Two tall arched windows to rear and arched louvre in gable. Two-storey side elevations are 4-window to E and 2-window to W with plain stone dressings. The windows have arched heads to upper level and cambered heads to lower level. At right angles to the W is the earlier chapel, rendered over rubble stone. Two-window, 2-storey side elevations. Round-arched windows over camber-headed windows, mainly with C20 glazing. Gabled W entrance has 2 round arched windows and central doorway with stone jambs and voussoirs. The earlier chapel retains its mid C19 interior: Lobby with stairs to U-plan gallery with panelled wooden frontal and clock, boarded wooden benches tiered to rear; classicising iron columns, wooden rails to windows and to stairs. At lower level, panelled dado, wooden benches. Steps up to pulpit have turned newels with acorn finials; arched recess to R, arched doorway to later chapel to L.
The 1876 chapel has lobby with stairs to gallery. Flat ceiling with diamond-pattern ribs, elaborate ceiling rose, outer band of exposed diagonal boarding. U-plan gallery with frontal of polished wood and pierced iron panels which are painted to imitate oxidised bronze as are fluted iron columns with floral capitals; gallery has panelled wooden seating, tiered, and organ at entrance end. Opposite this at N end, between 2 arched windows, arched recess with keystone above wooden bow-fronted pulpit which has curved steps to each side; panelled set fawr enclosure. Three banks of pews. Listed grade II* as a pair of chapel buildings illustrating changes in chapel architecture from the mid to later C19, both retaining good early character and detail. The chapel of 1879 is a good example of the work of Thomas Thomas with Glorification arch and unspoilt interior with unusual ironwork. A prominent landscape feature spanning the Rhymney valley between Maesycwmmer and Hengoed. Situated above Hengoed, close to Cefn Hengoed; set back from hill road that runs north from Ystrad Mynach. Burial ground to front with good C19 monuments. A472 skirts the W side of Ystrad centre; church is set back from the road on a knoll within a very hilly walled churchyard which falls away steeply to W and S, main entry at SE through lychgate. Just off Caerphilly Road in a square to the north of Ysbyty Ystrad Fawr, approx. 50m W of the Old Fire Station (rec no 13569). Originally situated off Park Road but now resited in grounds of Caerphilly County Borough Council offices at Ystrad Fawr, to W of main house.